For other uses, see Black Country (disambiguation). The Black Country is an area of the West Midlands, England, west of Birmingham and commonly refers to a region covering most of the four Metropolitan Boroughs of Dudley, Sandwell, Walsall and Wolverhampton. During the Industrial Revolution, it became one of the most industrialised parts of Britain with coal mines, coking, iron foundries, glass factories, brickworks and steel mills producing a high level of air pollution. The first trace of the phrase "The Black Country" as an expression dates from the 1840s. The name is believed to come from the soot from the heavy industries that covered the area, although the 30-foot-thick (10 metre) coal seam close to the surface is another possible origin. The 14-mile (23 km) road between Wolverhampton and Birmingham was described as "one continuous town" in 1785. Although the heavy polluting industry that gave the region its name has long since disappeared, a sense of shared history and tradition in the area has kept the term in use. In addition, the regeneration of the area by local and national government has brought official recognition to the region and to some extent defined its boundary. South Staffordshire in 1911. The Black Country region, as indicated on the map, lies to the west and north-west of the city of Birmingham. The Black Country has no single set of defined boundaries. Some traditionalists define it as "the area where the coal seam comes to the surface – so West Bromwich, Coseley, Oldbury, Blackheath, Cradley Heath, Old Hill, Bilston, Dudley, Tipton, Wednesfield and parts of Halesowen, Wednesbury and Walsall but not Wolverhampton, Stourbridge and Smethwick or what used to be known as Warley". There are records from the 18th century of shallow coal mines in Wolverhampton, however. Others have included areas slightly outside the coal field which were associated with heavy industry. Bilston-born Samuel Griffiths, in his 1876 Griffiths Guide to the Iron Trade of Great Britain , stated "The Black Country commences at Wolverhampton, extends a distance of sixteen miles to Stourbridge, eight miles to West Bromwich, penetrating the northern districts through Willenhall to Bentley, The Birchills, Walsall and Darlaston, Wednesbury, Smethwick and Dudley Port, West Bromwich and Hill Top, Brockmoor, Wordsley and Stourbridge. As the atmosphere becomes purer, we get to the higher ground of Brierley Hill, nevertheless here also, as far as the eye can reach, on all sides, tall chimneys vomit forth great clouds of smoke". He also stated that "Wolverhampton is considered to be The Capital of the Black Country", as well as "The Capital of the Iron Trade in the Black Country". Today the term commonly refers to the majority or all of the four metropolitan boroughs of Dudley, Sandwell, Walsall and Wolverhampton although it is said that "no two Black Country men or women will agree on where it starts or ends". Official use of the name came in 1987 with the Black Country Development Corporation, an urban development corporation covering the metropolitan boroughs of Sandwell and Walsall, which was disbanded in 1998. The Black Country Consortium (founded in 1999) and the Black Country Local Enterprise Partnership (founded in 2011) both define the Black Country as the four metropolitan boroughs of Dudley, Sandwell, Walsall and Wolverhampton, an approximate area of 138 square miles (360 km2). The borders of the Black Country can be defined by using the special cultural and industrial characteristics of the area. Areas around the canals (the cut) which had mines extracting mineral resources and heavy industry refining these are included in this definition. Cultural parameters include unique or characteristic foods such as Groaty pudding, Grey Peas and Bacon, faggots, gammon or pork hocks and pork scratchings; Black Country Humour; and the Black Country dialect. The Black Country Society defines the Black Country's borders as the area on the thirty foot coal seam, regardless the depth of the seam. This definition includes West Bromwich and Oldbury, which had many deep pits, and Smethwick. The thick coal that underlies Smethwick was not mined until the 1870s and Smethwick has retained more Victorian character than most West Midland areas. Sandwell Park Colliery's pit was located in Smethwick and had 'thick coal' as shown in written accounts from 1878 and coal was also heavily mined in Hamstead, further east, whose workings extended well under what is now north Birmingham. Smethwick and Dudley Port were described as "a thousand swarming hives of metallurgical industries" by Samuel Griffiths in 1872. The Black Country Society excludes Wolverhampton and Stourbridge geologically, but includes them culturally, linguistically and in terms of heavy industry as both had iron and steel works, manufacturing industries and contributed enormously to the region. Warley is also included, despite lacking industry and canals, as housing for industrial workers in Smethwick and Oldbury was built there. Another geological definition, the seam outcrop definition, only includes areas where the coal seam is shallow making the soil black at the surface. Some coal mining areas to the east and west of the geologically defined Black Country are therefore excluded by this definition because the coal here is too deep down and does not outcrop. The seam outcrop definition excludes areas in North Worcestershire and South Staffordshire. In this Black Country, including West Bromwich, Dudley, Darlaston, Bilston, Wolverhampton and several minor villages, a perpetual twilight reigns during the day, and during the night fires on all sides light up the dark landscape with a fiery glow. The pleasant green of pastures is almost unknown, the streams, in which no fishes swim, are black and unwholesome; the natural dead flat is often broken by high hills of cinders and spoil from the mines; the few trees are stunted and blasted; no birds are to be seen, except a few smoky sparrows; and for miles on miles a black waste spreads around, where furnaces continually smoke, steam engines thud and hiss, and long chains clank, while blind gin horses walk their doleful round. From time to time you pass a cluster of deserted roofless cottages of dingiest brick, half swallowed up in sinking pits or inclining to every point of the compass, while the timbers point up like the ribs of a half decayed corpse. The majority of the natives of this Tartarian region are in full keeping with the scenery – savages, without the grace of savages, coarsely clad in filthy garments, with no change on weekends or Sundays, they converse in a language belarded with fearful and disgusting oaths, which can scarcely be recognised as the same as that of civilized England. This work was also the first to explicitly distinguish the area from nearby Birmingham, noting that "On certain rare holidays these people wash their faces, clothe themselves in decent garments, and, since the opening of the South Staffordshire Railway, take advantage of cheap excursion trains, go down to Birmingham to amuse themselves and make purchases". The geologist Joseph Jukes made it clear in 1858 that he felt the meaning of the term was self-explanatory to contemporary visitors, remarking that "It is commonly known in the neighbourhood as the 'Black Country', an epithet the appropriateness of which must be acknowledged by anyone who even passes through it on a railway". Jukes based his Black Country on the seat of the great iron manufacture, which for him was geographically determined by the ironstone tract of the coalfield rather than the thick seam, running from Wolverhampton to Bloxwich, to West Bromwich, to Stourbridge and back to Wolverhampton again. 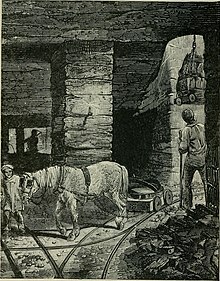 A travelogue published in 1860 made the connection more explicit, calling the name "eminently descriptive, for blackness everywhere prevails; the ground is black, the atmosphere is black, and the underground is honeycombed by mining galleries stretching in utter blackness for many a league". An alternative theory for the meaning of the name is proposed as having been caused by the darkening of the local soil due to the outcropping coal and the seam near the surface. It was however the American diplomat and travel writer Elihu Burritt who brought the term "the Black Country" into widespread common usage with the third, longest and most important of the travel books he wrote about Britain for American readers, his 1868 work Walks in The Black Country and its Green Borderland. Burritt had been appointed United States consul in Birmingham by Abraham Lincoln in 1864, a role that required him to report regularly on "facts bearing upon the productive capacities, industrial character and natural resources of communities embraced in their Consulate Districts" and as a result travelled widely from his home in Harborne, largely on foot, to explore the local area. Burritt's association with Birmingham dated back 20 years and he was highly sympathetic to the industrial and political culture of the town as well as being a friend many of its leading citizens, so his portrait of the surrounding area was largely positive. He was the author of the famous early description of the Black Country as "black by day and red by night", adding appreciatively that it "cannot be matched, for vast and varied production, by any other space of equal radius on the surface of the globe". Burritt used the term to refer to a wider area than its common modern usage, however, devoting the first third of the book to Birmingham, which he described as "the capital, manufacturing centre, and growth of the Black Country", and writing "plant, in imagination, one foot of your compass at the Town Hall in Birmingham, and with the other sweep a circle of twenty miles [30 km] radius, and you will have, 'the Black Country". However he also described a 'Black Country proper' including Wolverhampton, Dudley, and several smaller towns. 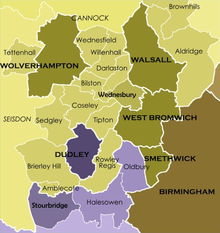 A few Black Country places such as Wolverhampton, Bilston and Wednesfield are mentioned in Anglo-Saxon charters and chronicles and the forerunners of a number of Black Country towns and villages such as Cradley, Dudley, Smethwick, and Halesowen are included in the Domesday Book of 1086. At this early date, the area was mostly rural. A monastery was founded in Wolverhampton in the Anglo-Saxon period and a castle and priory was built at Dudley during the period of Norman rule. Another religious house, Premonstratensian Abbey of Halesowen, was founded in the early 13th century. A number of Black Country villages developed into market towns and boroughs in the twelfth and thirteenth centuries, notably Dudley, Walsall and Wolverhampton. Coal mining was carried out for several centuries in the Black Country, starting from medieval times, and metalworking was important in the Black Country area as early as the 16th century spurred on by the presence of iron ore and coal in a seam 30 feet (9 m) thick, the thickest seam in Great Britain, which outcropped in various places. 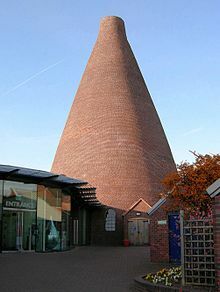 The first blast furnace recorded in the Black Country was built at West Bromwich in the early 1560s. Many people had an agricultural smallholding and supplemented their income by working as nailers or smiths, an example of a phenomenon known to economic historians as proto-industrialisation. In 1583, the accounts of the building of Henry VIII's Nonsuch Palace record that nails were supplied by Reynolde Warde of Dudley at a cost of 11s 4d per thousand. By the 1620s "Within ten miles [16 km] of Dudley Castle there were 20,000 smiths of all sorts". In the early 17th century, Dud Dudley, a natural son of the Baron of Dudley, experimented with making iron using coal rather than charcoal. Two patents were granted for the process: one in 1621 to Lord Dudley and one in 1638 to Dud Dudley and three others. In his work Metallum Martis, published in 1665, he claimed to have "made Iron to profit with Pit-cole". However, considerable doubt has been cast on this claim by later writers. An important development in the early 17th century was the introduction of the slitting mill to the Midlands area. In the Black Country, the establishment of this device was associated with Richard Foley, son of a Dudley nailer, who built a slitting mill near Kinver in 1628. The slitting mill made it much simpler to produce nail rods from iron bar. Another development of the early 17th century was the introduction of glass making to the Stourbridge area. One attraction of the region for glass makers was the local deposits of fireclay, a material suitable for making the pots in which glass was melted. In 1642 at the start of the Civil War, Charles I failed to capture the two arsenals of Portsmouth and Hull, which although in cities loyal to Parliament were located in counties loyal to him. As he had failed to capture the arsenals, Charles did not possess any supply of swords, pikes, guns, or shot; all these the Black Country could and did provide. From Stourbridge came shot, from Dudley cannon. Numerous small forges which then existed on every brook in the north of Worcestershire turned out successive supplies of sword blades and pike heads. It was said that among the many causes of anger Charles had against Birmingham was that one of the best sword makers of the day, Robert Porter, who manufactured swords in Digbeth, Birmingham, refused at any price to supply swords for "that man of blood" (A Puritan nickname for King Charles), or any of his adherents. As an offset to this sword-cutler and men like him in Birmingham, the Royalists had among their adherents Dud Dudley, now a Colonel in the Royalist army, who had experience in iron making, and who claimed he could turn out "all sorts of bar iron fit for making of muskets, carbines, and iron for great bolts", both more cheaply, more speedily and more excellent than could be done in any other way. In 1712, a Newcomen Engine was constructed near Dudley and used to pump water from coal mines belonging to Lord Dudley. This is the earliest documented working steam engine. A Black Country scene from the 1870s including coal mines, mineral railways, furnaces and factories. An important milestone in the establishment of Black Country industry came when John Wilkinson set up an iron works at Bradley near Bilston. In 1757 he started making iron there by coke-smelting rather than using charcoal. His example was followed by others and iron making spread rapidly across the Black Country. Another important development of the 18th century was the construction of canals to link the Black Country mines industries to the rest of the country. Between 1768 and 1772 a canal was constructed by James Brindley starting in Birmingham through the heart of the Black Country and eventually leading to the Staffordshire and Worcestershire Canal. In the middle of the 18th century, Bilston became well known for the craft of enamelling. 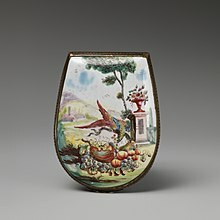 Items produced included decorative containers such as patch-boxes, snuff boxes and bonbonnieres. The iron industry grew during the 19th century, peaking around 1850-1860. In 1863, there were 200 blast furnaces in the Black Country, of which 110 were in blast. Two years later it was recorded that there were 2,116 puddling furnaces, which converted pig-iron into wrought iron, in the Black Country. In 1864 the first Black Country plant capable of producing mild steel by the Bessemer process was constructed at the Old Park Works in Wednesbury. In 1882, another Bessemer-style steel works was constructed at Spring Vale in Bilston by the Staffordshire Steel and Ingot Iron Company, a development followed by the construction of an open-hearth steelworks at the Round Oak works of the Earl of Dudley in Brierley Hill, which produced its first steel in 1894. By the 19th century or early 20th century, many villages had their characteristic manufacture, but earlier occupations were less concentrated. Some of these concentrations are less ancient than sometimes supposed. For example, chain making in Cradley Heath seems only to have begun in about the 1820s, and the Lye holloware industry is even more recent. The ironworks of W. Barrows and Sons, Tipton. Canals were of crucial importance in the development of Black Country industry. Prior to the Industrial Revolution, coal and limestone were worked only on a modest scale for local consumption, but during the Industrial Revolution by the opening of canals, such as the Birmingham Canal Navigations, Stourbridge Canal and the Dudley Canal (the Dudley Canal Line No 1 and the Dudley Tunnel) opened up the mineral wealth of the area to exploitation. Advances in the use of coke for the production of iron enabled iron production (hitherto limited by the supply of charcoal) to expand rapidly. By Victorian times, the Black Country was one of the most heavily industrialised areas in Britain, and it became known for its pollution, particularly from iron and coal industries and their many associated smaller businesses. This led to the expansion of local railways and coal mine lines. The line running from Stourbridge to Walsall via Dudley Port and Wednesbury closed in the 1960s, but the Birmingham to Wolverhampton line via Tipton is still a major transport route. The anchors and chains for the ill-fated liner RMS Titanic were manufactured in the Black Country in the area of Netherton. Three anchors and accompanying chains were manufactured; and the set weighed in at 100 tons. The centre anchor alone weighed 12 tons and was pulled through Netherton on its journey to the ship by 20 Shire horses. In 1913, the Black Country was the location of arguably one of the most important strikes in British trade union history when the workers employed in the area's steel tube trade came out for two months in a successful demand for a 23 shilling minimum weekly wage for unskilled workers, giving them pay parity with their counterparts in nearby Birmingham. This action commenced on 9 May in Wednesbury, at the Old Patent tube works of John Russell & Co. Ltd., and within weeks upwards of 40,000 workers across the Black Country had joined the dispute. Notable figures in the labour movement, including a key proponent of Syndicalism, Tom Mann, visited the area to support the workers and Jack Beard and Julia Varley of the Workers' Union were active in organising the strike. During this confrontation with employers represented by the Midlands Employers' Federation, a body founded by Dudley Docker, the Asquith Government's armaments programme was jeopardised, especially its procurement of naval equipment and other industrial essentials such as steel tubing, nuts and bolts, destroyer parts, etc. This was of national significance at a time when Britain and Germany were engaged in the Anglo-German naval arms race that preceded the outbreak of the First World War. Following a ballot of the union membership, a settlement of the dispute was reached on 11 July after arbitration by government officials from the Board of Trade led by the Chief Industrial Commissioner Sir George Askwith, 1st Baron Askwith. One of the important consequences of the strike was the growth of organised labour across the Black Country, which was notable because until this point the area's workforce had effectively eschewed trade unionism. The 20th century saw a decline in coal mining in the Black Country, with the last colliery in the region – Baggeridge Colliery near Sedgley – closing on 2 March 1968, marking the end of an era after some 300 years of mass coal mining in the region, though a small number of open cast mines remained in use for a few years afterwards. As the heavy industry that had named the region faded away, in the 1970s a museum, called the Black Country Living Museum started to take shape on derelict land near to Dudley. Today this museum demonstrates Black Country crafts and industry from days gone by and includes many original buildings which have been transported and reconstructed at the site. The history of industry in the Black Country is connected directly to its underlying geology. Much of the region lies upon an exposed coalfield forming the southern part of the South Staffordshire Coalfield where mining has taken place since the Middle Ages. There are, in fact several coal seams, some of which were given names by the miners. The top, thin coal seam is known as Broach Coal. Beneath this lies successively the Thick Coal, Heathen Coal, Stinking Coal, Bottom Coal and Singing Coal seams. Other seams also exist. The Thick Coal seam was also known as the "Thirty Foot" or "Ten Yard" seam and is made up of a number of beds that have come together to form one thick seam. Interspersed with the coal seams are deposits of iron ore and fireclay. The Black Country coal field is bounded on the north by the Bentley Fault, to the north of which lies the Cannock Chase Coalfield. Around the exposed coalfield, separated by geological faults, lies a concealed coalfield where the coal lies at much greater depth. A mine was sunk between 1870 and 1874 over the eastern boundary of the then known coal field in Smethwick and coal was discovered at a depth of over 400 yards. In the last decade of the 19th century, coal was discovered beyond the western boundary fault at Baggeridge at a depth of around 600 yards. A broken ridge runs across the Black Country in a north-westerly direction from Rowley Regis through Dudley, Wrens Nest and Sedgley, separating the Black Country into two regions. This ridge forms part of a major watershed of England with streams to the north taking water to the Tame and then via the Trent into the North Sea whilst to the south of the ridge, water flows into the Stour and thence to the Severn and the Bristol Channel. At Dudley and Wrens Nest, limestone was mined. This rock formation was formed in the Silurian period and contain many fossils. One particular fossilized creature, the trilobite Calymene blumenbachii, was so common that it became known as the "Dudley Bug" or "Dudley Locust" and was incorporated into the coat-of-arms of the County Borough of Dudley. At a number of places, notably the Rowley Hills and at Barrow Hill, a hard igneous rock is found. The rock, known as dolerite, used to be quarried and used for road construction. In recent years the Black Country has seen the adoption of symbols and emblems with which to represent itself. 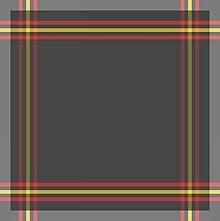 The first of these to be registered was the Black Country tartan in 2009, designed by Philip Tibbetts from Halesowen. In 2008 the idea of a flag for the region was first raised. After four years of campaigning a competition was successfully organised with the Black Country Living Museum. This resulted in the adoption of the Flag of the Black Country as designed by Gracie Sheppard of Redhill School in Stourbridge and was registered with the Flag Institute in July 2012. The flag was unveiled at the museum on 14 July 2012 as part of celebration in honour of the 300th anniversary of the erection of the first Newcomen atmospheric engine. Following this it was agreed by the museum and Black Country society for 14 July to be recognised as Black Country Day to celebrate the areas role in the Industrial Revolution. The day was marked by Department for Communities and Local Government in 2013 and following calls to do more in 2014 more events were planned around the region. Black Country Day takes place on 14 July each year, originally organised by Steven Edwards. Originally in March, the day was later moved to 14 July - the anniversary of the invention of the Newcomen steam engine. The Black Country Anthem was written by James Stevens and is performed by Black Country band The Empty Can. The idea for the anthem was raised in 2013 by James Stevens and Steven Edwards who wanted the region to have an official anthem to accompany the Black Country flag & Black Country Day. The heavy industry which once dominated the Black Country has now largely gone. The 20th century saw a decline in coal mining and the industry finally came to an end in 1968 with the closure of Baggeridge Colliery near Sedgley. Clean air legislation has meant that the Black Country is no longer black. The area still maintains some manufacturing, but on a much smaller scale than historically. 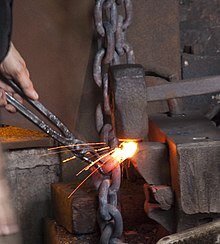 Chainmaking is still a viable industry in the Cradley Heath area where the majority of the chain for the Ministry of Defence and the Admiralty fleet is made in modern factories. Much but not all of the area now suffers from high unemployment and parts of it are amongst the most economically deprived communities in the UK. This is particularly true in parts of the metropolitan boroughs of Sandwell, Walsall and Wolverhampton. According to the Government's 2007 Index of Deprivation (ID 2007), Sandwell is the third most deprived authority in the West Midlands region, after Birmingham and Stoke-on-Trent, and the 14th most deprived of the UK's 354 districts. Wolverhampton is the fourth most deprived district in the West Midlands, and the 28th most deprived nationally. Walsall is the fifth most deprived district in the West Midlands region, and the 45th most deprived in the country. Dudley fares better, but still has pockets of deprivation. Overall Dudley is the 100th most deprived district of the UK, but the second most affluent of the seven metropolitan districts of the West Midlands, with Solihull coming top. It also benefits from tourism due to the popularity of the Black Country Living Museum, Dudley Zoo and Dudley Castle. As with many urban areas in the UK, there is also a significant ethnic minority population in parts: in Sandwell, 22.6 per cent of the population are from ethnic minorities, and in Wolverhampton the figure is 23.5 per cent. However, in Walsall 84.6 per cent of the population is described as white, while in Dudley 92 per cent of the population is white. Resistance to mass immigration in the 1950s, 1960s and 1970s led to the slogan "Keep the Black Country white!". The Black Country suffered its biggest economic blows in the late 1970s and early 1980s, when unemployment soared largely because of the closure of historic large factories including the Round Oak Steel Works at Brierley Hill and the Patent Shaft steel plant at Wednesbury. Unemployment rose drastically across the country during this period as a result of Conservative Prime Minister Thatcher's economic policies; later, in an implicit acknowledgement of the social problems this had caused, these areas were designated as Enterprise Zones, and some redevelopment occurred. Round Oak and the surrounding farmland was developed as the Merry Hill Shopping Centre and Waterfront commercial and leisure complex, while the Patent Shaft site was developed as an industrial estate. Unemployment in Brierley Hill peaked at more than 25% – around double the national average at the time – during the first half of the 1980s following the closure of Round Oak Steel Works, giving it one of the worst unemployment rates of any town in Britain. The Merry Hill development between 1985 and 1990 managed to reduce the local area's unemployment dramatically, however. The Black Country Living Museum in Dudley recreates life in the Black Country in the early 20th century, and is a popular tourist attraction. On 17 February 2012 the museum's collection in its entirety was awarded Designation by Arts Council England (ACE). Designation is a mark of distinction that celebrates unique collections of national and international importance. The four metropolitan boroughs of the Black Country form part of the Birmingham metropolitan economy, the second largest in the UK. In 2011, the government announced the creation of the Black Country Enterprise Zone. The zone includes 5 sites in Wolverhampton and 14 in Darlaston. The i54 business park in Wolverhampton is the largest of the 19 sites; its tenants include Jaguar Land Rover. The largest site in Darlaston is that of the former IMI James Bridge Copper Works. The four boroughs of Dudley, Sandwell, Wolverhampton and Walsall submitted a joint bid in late 2015 to become a UNESCO Global Geopark. The Geopark would increase the area's prospects as a tourism destination thereby supporting the local economy. To this end numerous 'geosites' were subsequently identified, leaflets published and public events organised. As of 2017, UNESCO had given the aspirant geopark its initial backing pending further assessment. The traditional Black Country dialect, known as "Black Country Spake" (as in "Where's our Spake Gone", a 2014–2016 lottery-funded project to preserve and document the dialect) preserves many archaic traits of Early Modern English and even Middle English and can be very confusing for outsiders. Thee, Thy and Thou are still in use, as is the case in parts of Yorkshire and Lancashire. "'Ow B'ist," or "Ow b'ist gooin" (How are you/ how are you going), to which typical responses would be "Bostin', ah kid" (Bostin' means "Busting", as in breaking, and is similar in usage to "smashing"; and "Ah Kid" (our kid) is a term of endearment - relatively recently imported from Liverpool-centric T.V. shows in the 1900s) or "'Bay too bad," or even "bay three bad" ("I be not too bad"/ I'm not too bad). Ain't is in common use as when "I haven't seen her" becomes "I ay sid 'er." Black Country dialect often uses "ar" where other parts of England use "yes" (this is common as far away as Yorkshire). Similarly, the local version of "you" is pronounced /jaʊ/ YOW, rhyming with "now." The local pronunciation includes "goo" (elsewhere "go") or "gewin'" is similar to that elsewhere in the Midlands. It is quite common for broad Black Country speakers to say "'agooin'" where others say "going." A woman is a "wench", a man is a "mon", a nurse is a "nuss" and home is "wom". An apple is an "opple". Food may be called "fittle" (after victuals or "vittles"), so "Bostin fittle" is "good food". The dialect has local differences, and sounds and phrases differ across the towns; often people can mishear a word or phrase and write it down wrong as in "shut charow up," which actually is "shut ya row up," so one has to be careful when hearing words and phrases. From the 19th century onwards, the area gained widespread notoriety for its hellish appearance, a depiction that made its way into the published works of the time. Charles Dickens's novel The Old Curiosity Shop, written in 1841, described how the area's local factory chimneys "Poured out their plague of smoke, obscured the light, and made foul the melancholy air". In 1862, Elihu Burritt, the American Consul in Birmingham, described the region as "black by day and red by night", because of the smoke and grime generated by the intense manufacturing activity and the glow from furnaces at night. Early 20th century representations of the region can be found in the Mercian novels of Francis Brett Young, most notably My Brother Jonathan (1928). Carol Thompson the curator "The Making of Mordor" at Wolverhampton Art Gallery in the last quarter of 2014 stated that J. R. R. Tolkien's description of the grim region of Mordor "resonates strongly with contemporary accounts of the Black Country", in his famed novel The Lord of the Rings. Indeed, in the Elvish Sindarin language, Mor-Dor means Dark (or Black) Land. It is also claimed by one Black Country scholar (Peter Higginson) that the character of Bilbo Baggins may have been based on Tolkien's observation of Mayor Ben Bilboe of Bilston in The Black Country, who was a Communist and Labour Party member from the Lunt in Bilston. But the scholarly evidence for this is still questionable. David Bowie’s 1970 album The Man Who Sold the World (UK release 1971) includes the track "Black Country Rock". The British band The Mighty Lemon Drops, themselves from Wolverhamption in The Black Country, released a live album entitled Young, Gifted & Black Country in 2004. The Black Country is notable for its small breweries and brewpubs which, unlike most in Britain, continued brewing their own beer alongside larger breweries which opened in the Industrial Revolution. Small breweries and brewpubs in the Black Country include Bathams in Brierley Hill, Holdens in Woodsetton, Sarah Hughes in Sedgley and the Old Swan Inn (Ma Pardoe's) in Netherton. They produce light and dark mild ales, as well as malt-accented bitters and seasonal strong ales. The Black Country is home to one television station, Made in Birmingham, and three region wide radio stations – BBC WM, Free Radio and Free Radio 80s. Both Free Radio (formerly Beacon Radio) and Free Radio 80s (formerly Beacon 303, Radio WABC & Gold) have broadcast since 1976 from transmitters at Turner's Hill and Sedgley, with the studios which were previously located in Wolverhampton being moved to Oldbury and Birmingham respectively. The area also has three other radio stations which only officially cover part of the region. Black Country Radio (born from a merger of 102.5 The Bridge and BCCR) who are based in Stourbridge, Signal 107 who broadcast from Wolverhampton and Ambur Radio who broadcast from Walsall. The Express and Star is one of the region's two daily newspapers, publishing eleven local editions from its Wolverhampton headquarters and its five district offices (for example the Dudley edition is considerably different in content from the Wolverhampton or Stafford editions). It is the biggest selling regional paper in the UK. Incidentally, the Express and Star, traditionally a Black Country paper, has expanded to the point where they sell copies from vendors in Birmingham city centre. The Black Country Mail – a local edition of the Birmingham Mail – is the region's other daily newspaper. Its regional base is in Walsall town centre. Established in 1973, from a site in High Street, Cradley Heath, the Black Country Bugle has also contributed to the region's history. It started as a fortnightly publication, but due to its widespread appeal, now appears on a weekly basis. It is now located above the Dudley Archives and Local History Centre on Tipton Road, Dudley. Pays Noir (in French meaning "Black country"), referring to Sillon industriel, a similar early industrial region in Belgium. ^ "Introduction to the Black Country" (PDF). Walsall MBC. Retrieved 4 April 2018. ^ "What or where is the Black Country?". Blackcountrysociety.co.uk. Retrieved 13 January 2012. ^ a b c "What and where is the Black Country?". BBC. Retrieved 28 May 2014. ^ Jones, Peter M. (2009). Industrial Enlightenment: Science, technology and culture in Birmingham and the West Midlands, 1760–1820. Manchester: Manchester University Press. p. 27. ISBN 0-7190-7770-2. ^ "RR Angerstein's Illustrated Travel Diary 1753-55"
^ Parsons, Harold (1986). Portrait of the Black Country. London: Robert Hale. ISBN 0709025742. ^ a b c Palliser, D.M. (1976). The Staffordshire Landscape. London: Hodder and Staunton. ISBN 0340129948. ^ "Official Black Country history website, featuring content supplied by the metropolitan boroughs of Dudley, Sandwell and Walsall, and the City of Wolverhampton". Blackcountryhistory.org. Retrieved 7 July 2011. ^ "Birmingham and the Black Country are neighbouring areas located in the English West Midlands. ... The Black Country has no agreed physical or political boundaries being defined instead of what is it is not, and primarily, by its residents, in opposition to the neighbouring large city of Birmingham" (Clark 2013, p. 140). ^ a b "Enterprise Zones: only one piece of the economic regeneration puzzle". London Chamber of Commerce and Industry. July 2012. Archived from the original (PDF) on 11 August 2017. ^ "About Us - BCLEP". Black Country LEP. Retrieved 14 June 2017. ^ "Black Country Jokes". www.bbc.co.uk. Retrieved 31 October 2017. ^ Chitham, Edward (2009). The Black Country. Amblerley Publications. p. 152. ^ "Reform dinner at Lichfield". Staffordshire Advertiser. 27 November 1841. Retrieved 17 June 2016. ^ Gresley, William (1846). Colton Green, a tale of the black country. London: J. Masters. ^ Upton, Chris (18 November 2011). "And so it came to pass..." Birmingham Post. Trinity Mirror Midlands. Retrieved 18 November 2013. ^ a b c d e Jones, Gavin (4 April 2013). "'Black Country' in print over twenty years before Elihu Burritt". Black Country Bugle. Staffordshire Newspapers Limited. Retrieved 18 November 2013. ^ Sidney, Samuel. "Rides on Railways". AJH Computer Services. Retrieved 18 November 2013. ^ "distinctly black country". Archived from the original on 8 January 2012. Retrieved 27 September 2011. ^ Mugridge, Stuart (2007). 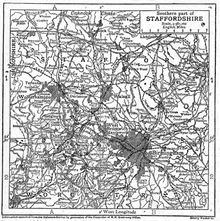 "Mapping The Black Country" (PDF). Retrieved 22 November 2013. ^ a b Marsh, Peter T. (September 2013). "Burritt, Elihu (1810–1879), peace campaigner and American consul". Oxford Dictionary of National Biography. Oxford: Oxford University Press. Retrieved 22 November 2011. ^ Chapman, Gordon (23 February 2006). "'Ackle' – a word causing some hassle!". Black Country Bugle. Staffordshire Newspapers. Archived from the original on 23 November 2013. Retrieved 22 November 2013. ^ "Press Pack" (pdf). Black Country Living Museum. p. 3. Retrieved 23 November 2013. ^ Ian, Walden (29 July 2007). "Keeping history alive; Ian Walden, Director of The Black Country Living Museum in Dudley, explains why he thinks Birmingham and the West Midlands needs more of a vision". Birmingham Post. Trinity Mirror Midlands. Retrieved 23 November 2013. ^ a b Barnsby, George J. (1985). The origins of Wolverhampton to 1085. Wolverhampton Borough Council. ISBN 0905654064. ^ Hemingway, John (2006). An Illustrated Chronicle of the Castle and Barony of Dudley 1070-1757. Dudley: The Friends of Dudley Castle. ISBN 9780955343803. ^ "Houses of Premonstratensian canons: Abbey of Halesowen | British History Online". www.british-history.ac.uk. Retrieved 31 July 2017. ^ "History of Saltwells Local Nature Reserve". Dudley Metropolitan Borough Council. Retrieved 24 June 2013. ^ a b c d Gale, W.K.V. (1966). The Black Country Iron Industry. London: The Iron and Steel Institute. pp. 1–22. ^ Willis-Bund, W.; Page, William (1906). The Victoria History of the County of Worcester. Volume 2. London: Archibald Constable. p. 272. ^ Dudley 1854, p. 7. ^ "Dud Dudley & Abraham Darby: Forging New Links | The Black Country Society". www.blackcountrysociety.co.uk. Retrieved 20 November 2017. ^ Willis-Bund, W.; Page, William (1906). The Victoria History of the County of Worcester. Volume 2. London: Archibald Constable. pp. 278–281. ^ "Newcomen Engine - Black Country Living Museum". www.bclm.co.uk. Retrieved 20 November 2017. ^ Paget-Tomlinson, Edward W. (2006) . The Illustrated History of Canal & River Navigations. Landmark Publishing Ltd. ISBN 1-84306-207-0. ^ Parsons, Harold (1986). Portrait of the Black Country. London: Robert Hale. pp. 67–87. ISBN 0709025742. ^ Gale, W.K.V. (1979). The Black Country Iron Industry. London: The Metals Society. pp. 83–101. ISBN 0904357236. ^ a b c Gale, W.K.V. (1979). The Black Country Iron Industry. London: The Metals Society. pp. 102–118. ISBN 0904357236. ^ Knox, Collie (1957). Steel at Brierley Hill. Manchester: Newman Neame. ^ "Closing of Baggeridge". Blackcountrysociety.co.uk. Retrieved 7 July 2011. ^ "Coal and Iron". maps.nls.uk. Archived from the original on 30 November 2012. Retrieved 3 August 2017. ^ Cameron, D.G. "Mineral Resource Information for Development Plans". www.bgs.ac.uk. British Geological Survey. Retrieved 17 July 2017. ^ Murchison, Roderick (1839). The Silurian System. London: John Murray. pp. 463–479. ^ a b c Jukes, Joseph Beete (1859). The South Staffordshire coal-field. London: Longman, Green, Longman and Roberts. ^ Chapman, Nigel (2009). South Staffordshire Coalfield. Stroud: Amberley Publishing Limited. ISBN 9781848689718. ^ "Sinking of Baggeridge". www.blackcountrysociety.co.uk. Archived from the original on 12 March 2005. Retrieved 21 July 2017. ^ "The most fossiliferous place in the United Kingdom!". www.dudley.gov.uk. Archived from the original on 13 May 2013. Retrieved 21 July 2017. ^ Samuel Timmins (1865). The Resources, Products and Industrial History of Birmingham and the Midland Hardware District. London: Hardwicke. pp. 11–13. ^ Bristow, C.M. ; Sedman, J.; Beatty, D.; Nice S.; Lucas H.; Griffiths R.; Stanton W.; Harrison D.; Barrett B.; Roberts D. (2002). "Appendix 1: The field excursions at the conference". In Scott P.W. & Bristow C.M. (ed.). Industrial minerals and extractive industry geology: based on papers presented at the combined 36th Forum on the Geology of Industrial Minerals and 11th Extractive Industry Geology Conference, Bath, England, 7th-12th May, 2000. Special publication. London: Geological Society. p. 368. ISBN 978-1-86239-099-7. Retrieved 6 January 2018. ^ "Barrow Hill Local Nature Reserve". www.dudley.gov.uk. Dudley MBC. Retrieved 6 January 2018. ^ "Black Country Flag Design – Officially Registered". Black Country Museum. 14 July 2012. Retrieved 12 May 2015. ^ "Flying the Flag for the Black Country". Express & Star. Retrieved 22 January 2014. ^ "A Flag for the Black Country". BBC. Retrieved 22 January 2014. ^ "Budding artists invited to design official Black Country flag". Dudley News. Retrieved 22 January 2014. ^ "Black Country Flag". British County Flags. Retrieved 22 January 2014. ^ "Black Country – UK Flag Registry". Flag Institute. 22 January 2014. ^ "Black Country Flag Design – Officially Registered". Black Country Living Museum. April 2012. ^ "Black Country Day". British County Flags. Retrieved 22 January 2014. ^ "Black Country flag flies high in Whitehall". Department for Communities and Local Government. Retrieved 22 January 2014. ^ "Let's fly the flag for the Black Country Day". Express & Star. 3 August 2013. Retrieved 22 January 2014. ^ "Black Country Day 2014". Express & Star. 21 January 2014. Retrieved 22 January 2014. ^ "Arts Council Designation Scheme" (PDF). Retrieved 30 June 2016. ^ "New 'enterprise zones' announced around England". BBC News Online. 17 August 2011. Retrieved 11 March 2015. ^ "More than 350 jobs to be created at site". Express & Star. 16 June 2013. Retrieved 11 March 2015. ^ a b BBC staff (20 September 2014). "Was the Lord of the Rings inspired by Black Country industry?". BBC. Retrieved 2 February 2019. ^ John Plunkett (25 August 2010). "Regional newspaper ABCs: Two evening papers buck downward trend | Media | guardian.co.uk". London: Guardian. Retrieved 20 July 2011. Raybould, T. J. (1973). The Economic Emergence of the Black Country: A Study of the Dudley Estate. Newton Abbot: David & Charles. ISBN 0-7153-5995-9. Rowlands, M. B. (1975). Masters and Men in the West Midlands metalware trades before the industrial revolution. Manchester: Manchester University Press. Gale, W. K. V. (1966). The Black Country Iron Industry: A Technical History. London: The Iron and Steel Institute. Higgs, L. (2004) A Description of Grammatical Features and Their Variation in the Black Country Dialect Schwabe Verlag Basel. Led Zeppelin (1975). "Black Country Woman", Physical Graffiti. Webster, L. (2012) Lone Wolf: memoirs in the form of short stories. Dudley: Kates Hill Press. ISBN 978-1-904552-42-0.